Something that is becoming increasingly problematic lately is Google Analytics Referral Spam. 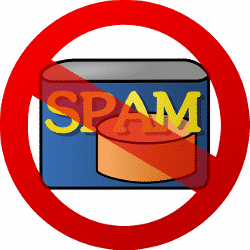 Referral spam can wreak havoc with your Analytics stats, if left unchecked. 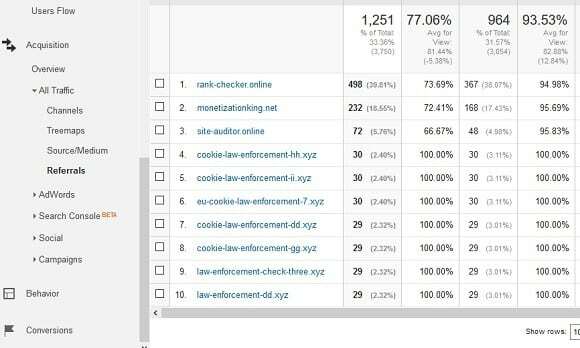 Referral spam occurs when your site gets fake referral traffic from spam bots and this fake traffic is recorded in your Google Analytics stats. This is something you need to be aware of, so that you can take steps to filter that traffic out. Acquisition -> All Traffic -> Referrals. If your results look similar to mine above, or you see odd sites that you wouldn’t think people would come from to visit your site, you are probably also being hit by Google Analytics Referral Spam. The referral traffic page is supposed to show you the sites that people came to your website from, but every single one of those entries in the image above are spam. The people that run those sites know how to get their URLs to show up in your Google Analytics data. Their intent can range from deceptive to malicious. In most cases their goal is to get you to visit their website, which is exactly what I did initially. The site looked legitimate and on the main page it talked about the new EU cookie requirements and they provided some code that you can copy/paste into your own website to be sure you are “compliant”. Of course, I did NOT do that and right afterwards I searched Google for the different websites in the list and found out it was all spam. The good news is that from what I read, in most cases, those sites are not actually hitting your website. They just show up in your stats as if it is legitimate traffic. However, you can clearly see that they hinder your ability to see your actual traffic and they really skew your numbers. You definitely want to do what you can to filter that fake traffic out, so that you can get to the real data. The primary way that I saw recommended most often was to setup filters in Google Analytics. The primary sites that were showing up in my stats over the last several months were as follows. Your specific results will be different, so you’ll need to plug in the sites you see in your own data, but the steps will be the same. 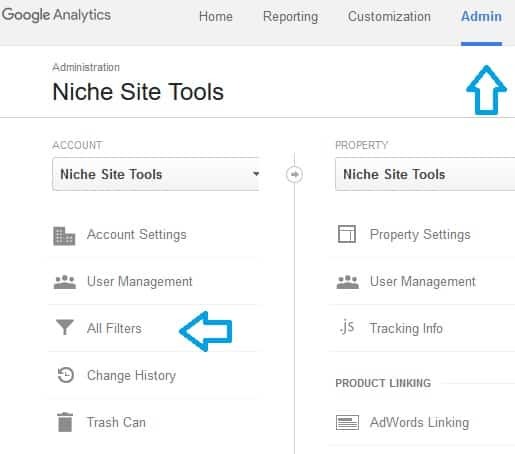 First, login to your Google Analytics account and then click on Admin at the top, select your site from the drop down list and then click on All Filters. Then click the option to Add Filter. Each individual filter can have a maximum of 255 characters, so I actually needed to create 3 separate ones. I named them spam bots 1-3. For Filter Type, choose Custom. 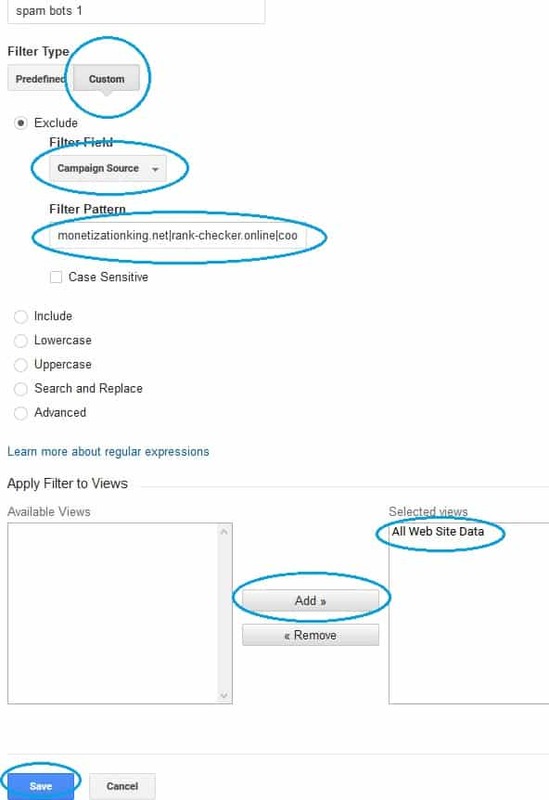 For Filter Field, select Campaign Source. For filter pattern, type in each URL that shows up in your stats with each one separated by a “|”. Then towards the bottom, select All Website Data under available views, click the Add button and then hit save at the bottom. If you have as many sites show up as I did, you’ll need to create more than 1 filter due to the 255 character limit for the Filter Pattern field. If so, follow the same steps for the remaining sites. 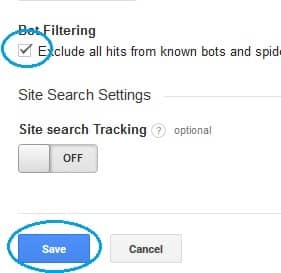 There is also an option to have Google “Exclude all hits from known bots and spiders”. In my case, that didn’t make any difference, but it can’t hurt to enable that for if / when they get better about that in the future. To enable that, on the same Admin screen, under the View column select View Settings. In that column, scroll towards the bottom and click the checkbox for Bot Filtering, then click Save. 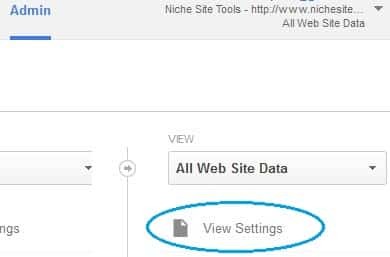 With the manual filters that you added above and that option enabled, your Google Analytics stats should be good in the short-term, going forward. Unfortunately, that won’t fix your stats retroactively, so that is why you’ll want to go in and enable the filters ASAP so that your data will be more useful in the future. Of course, that only takes care of the referral spam that you’ve had thus far. Hopefully enabling the automatic Bot Filtering will help out in the future, but you may have to go in every so often and add new sites to your filters as they appear in your referral traffic. I’d say checking that once every other week, should be sufficient. I’m by no means the expert on this topic, but by following the steps above, I was able to cleanup my stats and hopefully you can as well. The links that I read and utilized for reference are included at the bottom of this post. The tool of the week is RiteTag’s Trending Hashtags page. It shows you hashtags that are currently trending on Twitter and you can also search for specific keywords and see what is trending on that topic. 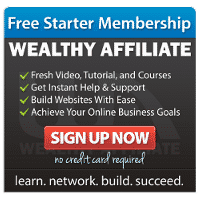 I found it helpful this past week and I posted a link to that site in the Private Facebook Mastermind group and it was a hit with others as well. 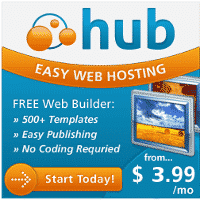 For anyone that is looking to sign-up for new web hosting or anyone that has experienced problems with their existing web host and would like to switch, I completely updated my How To Start a Blog Guide this past week for new folks and have a guide on How To Transfer Your Site For Free as well, in case you are interested.